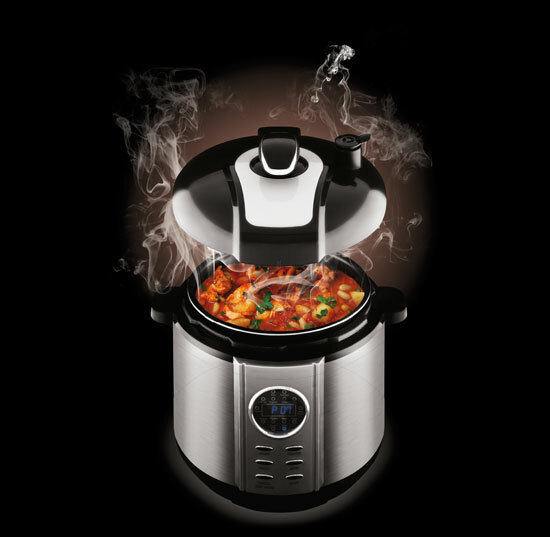 The food is cooked in 30% less time. With the Smart Pressure Cooker, all the flavour and speed of a traditional pressure cooker go hand in hand with all the convenience of the digital era. The cooker includes 14 pre-set cooking modes, one manual mode and a function for keeping food warm. Capacity of up to 6 litres. Made of durable materials and features a safety mechanism. Cooker set includes: non-stick inner pot, steaming rack, condensation collector, measuring cup & spatula. Prepare delicious meals in a third of the time and keep in up to 90% of food’s original nutrients!